At the very start of the relocation process we proclaimed that we would not move anything that, upon unpacking, we’d scratch our heads, wondering why we actually put it in a box and onto a moving truck. Well, my husband proclaimed, I reluctantly agreed. As such began the purge. A little back story, I’m Dutch. The Dutch are notoriously frugal. Frugal: sparing or economical with regard to money or food. The trendy term is minimalist, but I was minimalist before it was cool, pretty much from the womb, in fact. I don’t buy much, but once I own it, I keep it, determined to put it to as much use as humanly possible. I’m pretty sure that in the Dutch language waste is a four letter word. Not only do we not buy much, we keep what we buy. Thus, this whole purging thing felt pretty much like blasphemy to me. Reluctance is the name of my game. 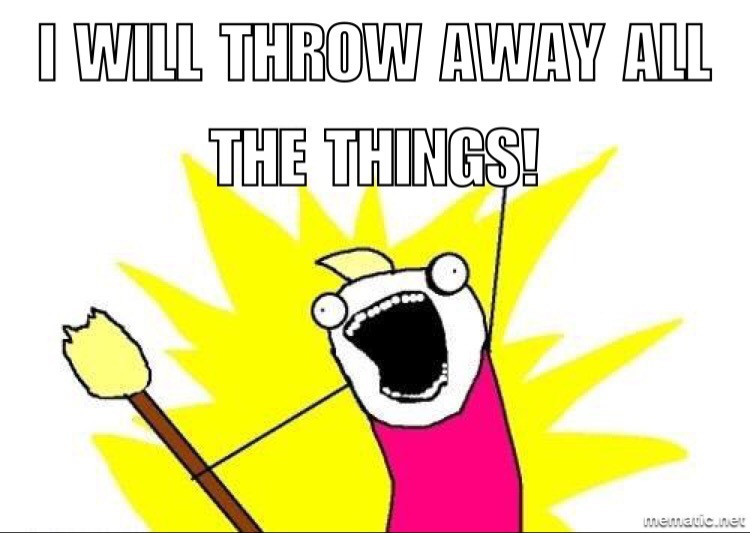 Every item picked up gets careful consideration and a second opinion from my husband, whose universal answer is “toss it” (Shoot). I’ve always been good at the donations. Armed with a pen and notebook I take careful inventory for tax deductions then take pleasure in dropping off the items at our local nonprofit which sells our items to provide support local families. Having volunteered for the organization I’m fully bought in and have zero qualms about sending them anything useful. It’s the throw away pile that kills me. And our Christmas tree. Purchased from Target for $69.99 eleven years ago, just to get us through a couple of seasons. It started out pathetic and grew to be just hideous. I’ve taken pride in leaving it as wonky as possible and considering it my “Charlie Brown Christmas Tree”. But in our new house, a log house with cathedral ceilings and a stone fireplace, it simply won’t do. A majestic real tree will take it’s place this year, but not without a moment of silence for our beloved junker that will probably be found in an archeological excavation in the year 5872 by foljs wondering what the heck we did with such things. Once I got going this throwing away thing has it’s perks. It feels like freedom! Like shedding skin! It is spring after all and suddenly the momentum is building and I’m hauling garbage bags from one room to the next, cackling as I go and skipping as I drag the overflowing dumpster to the curb, weighted down with 16 years worth of accumulated crap. Not that I’m getting carried away or anything. My husband who started the whole purging process in the first place can now be seen rushing to pack boxes as quickly as possible, attempting to save the last vestiges of our 22 years worth of accumulated household belongings. It’s a hysterical race to see who gets the most stuff in their pile. He’s winning, but I still stand a chance. Nope, I’m not getting carried away at all. I might default on my mortgage to pay for it. I happen to be awfully fond of my pancreas. My imagination is a touch too active and I get the heebeegeebees over the idea of partaking of a unicorn. I’m afraid I’ll love it and crave more. My mama taught me I don’t have to do what all the other kids are doing. If I’m dropping my hard earned cash at a Starbucks there had darn well better be caffeine involved! A fairy dies every time a barista mixes one. But mostly because I’m stubborn and ornery. I’m passing on this craze, after all I’m pretty partial to my preexisting cravings, but if you do claim to partake, it didn’t happen unless there’s a selfie involved; bonus points for a Snapchat filter! As we drove up the hill to my parent’s condominium for Easter on Sunday, one of those moments happened. The trigger was tiny, ridiculous, but there it was. A toddler walking with his dad, holding one of dad’s fingers, going at a turtle’s pace. And there it was, as if it dropped from the heavens into my heart, sorrow, and a tear, quickly rubbed away hopefully unnoticed by anyone but me. It was one of those unpredictable moments of grief that crop up along the way when you parent children with disabilities. Why did that sight get to me? Because we did that exact same thing with oldest child, Hannah. The child who sat through church and then has to wait for dinner on a holiday, and they’re restless and buggy, so you take them out for a little walk to blow off the steam. It was a totally normal parenting moment. And a moment I never shared with my boys. Alex could walk around that age, but going for a walk was out of the question, and Ben didn’t even take his first steps until he was well over two years old. When we found out Alex had Down syndrome when he was born we took the time to grieve the big stuff and gain perspective, the big stuff isn’t sneaky, it’s right there in front of you, demanding to be dealt with. It’s the minute, every day moments that sneak up on you with grief that’s almost entirely unpredictable. How would one expect, when carting an 11 and almost 15 year old to Grammy’s house to be struck with a moment of grief from early childhood. Even though it can be a giant pain in the hiney to have to manage a restless toddler during a long day of holiday celebrations, it so often happens that during those moments the real sweetness of parenting occurs. That time he first sees a frog or picks up a stick which, during the course of the brief walk, becomes all manner of tools. The moments of little joys that are often remembered long after all the egg hunts and Easter dinners become almost indistinguishable in our one from the next in your memory. Then there are the moments you don’t realize you’re missing until it smacks you in the face, with no advance warning, and that is the ongoing grieving of parenting children with disabilities. You can go weeks or months without ever feeling a twinge, but there’s always something beneath the veneer that is waiting to be revealed, with the most uneventful of events. Like seeing a father and son out for a perfectly normal walk. I have been outspoken about my opinions on Lularoe; opinions which are essentially based on my annoyance at being added to sales groups without the consultant or party holder asking first, which means that I despise everything about them on principle. So in a brilliant move, my friend Kristy challenged my prejudice. She offered to send me a pair of workout capris in exchange for a completely honest review. They’re cute! The accents are fun and match one of my favorite workout shirts. The brushed lining feels delightful. They’re comfortable and I can move easily in them. The waistband felt tight at first, and seemed to need breaking in. I’m pear shaped so usually waistbands aren’t tight on me. On first wear the waistband was stiff, it did seem to improve with time. They are not in the same league as my favorite brands, Brooks and Nike, which are dedicated workout brands, as far as both fit and performance. The fit is high waisted, especially in front. Tied in with the above observation, there was a bit of “extra” material on my lower tummy, which could be because of my build. I don’t plan to wear them in hot weather because the soft fuzzy lining wouldn’t be ideal in high sweat conditions. 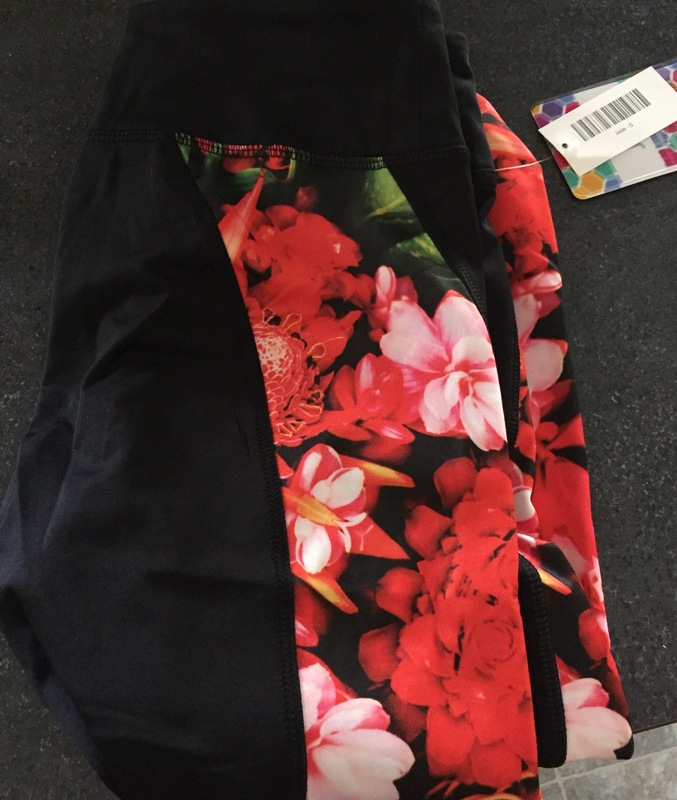 These are cute, comfortable capris which would be great for walks or other light to moderate workouts. If you’re a serious athlete, they won’t perform like the dedicated athletic brands, so you might be disappointed. Overall a good pair of capris for a day of light to moderate activity. I’ve seen this viral Facebook post several times, and each time I see it I read it. And each time I read it I’m puzzled. We write poems about the beauty of a sunrise. We photograph the breathtaking vistas of the mountains. We see beauty throughout this world and well into the universe. I find myself just as much in awe of the human form, be it male or female, as I am of all the other beauty in nature, because human beings are part of the majesty of the universe. Not only do we marvel at beauty, we have an innate longing to be beautiful, and to be told of our beauty. Should I not fulfill my daughter’s longing? Should I leave her wondering? So while there is so much good in that viral post about showing our daughters what is good about activity and food, I cannot embrace it. If I speak of the beauty of my dog as she bounds through a field, but not of my daughter as she does likewise, won’t she notice my silence? If I am stunned by the glory of a perfect sunset, but not of my daughter’s eyes or hair in just the right light, what will she think? And though I would never shame her for weight gain or loss, I don’t think it should go unspoken either; it should be a subject for discussion just like getting a haircut or having a cut, or anything else that goes with having a body. It seems it would be unwise to make such a subject taboo or untouchable, I would much rather make it as common as speaking of the grass growing. Our bodies do change, and we can discuss it. We don’t need that extra 20 lbs to be the elephant in the room any more than we want it to be a source of unhappiness or shame. Isn’t not speaking of our bodies and the changes they encounter just as shameful as insulting ourselves? How will my daughter bring up a concern over a change in her weight if we have never spoken of such things? If she is concerned, I most certainly want to know it! So yes, my love, do things because they empower you, because you’re more alive when you do them. Use your body to mobilize your beautiful soul, but also, please, delight in the beauty that is you. Because sometimes when I look at you tears well up in my eyes, taking in your glorious appearance. I see your eyes in that certain light, and they inspire me like a sunrise. Your hair is as glorious as a wildflower meadow in bloom. Your youthful body is a stunning and fresh as my middle-aged body is confident and assured by experience and use. Whether you can barely keep your size 0 jeans over your hips or you’re well into the double digits, you carry yourself with aplomb and grace that size cannot quantify. And sometimes my darling, you’re simply cute. And we will bake grandma’s cookies together and make healthy smoothies, and everything in between, because, you are lovely, in body, mind and soul. Hannah was being frank about her feelings about our family situation. It obviously bothered the listener. I don’t recall Hannah’s exact words, but the were not insults, were not made in an angry tirade, and included no cussing. It was just an honest assessment of our current situation. Our situation isn’t always pretty. Hannah and Alex get the scraps of our parenting efforts leftover after Ben devours his feast. While Hannah is empathetic, thoughtful, kind and loyal, she’s also honest, and quite frankly, sometimes it outright stinks to have a sibling with enormous needs. So I considered her statement and voiced my approval. She was right, after all. I can’t fix the stress and strain in our family. It’s hard, not only as primary caregivers, but for children whose parents are burned out from the vigilance it takes to meet complex behavioral, developmental and medical needs. I cannot count the times we have been unable to do some totally normal thing because it’s impossible to juggle one more thing. Or the times that we promised something we ended up unable to deliver because a high priority issue came up. Sometimes Hannah and Alex take the filter off and tell it like it is. And I wholeheartedly allow it. When kids are little we tell them to “use their words” to express frustrations, rather than acting out. When the older kids vent to me about the stress and disappointment of constantly being displaced to accommodate their brother, they’re using their words. Isn’t that what I taught them to do? Sometimes their words sting. It’s difficult to accept that the reality of our family means that 2 out of 3 children usually get a crummy deal. I don’t like to hear my parenting failures spelled out in the vents of my kids, and sometimes they point out things that really sting. But if I shut them down, where would they go with their discontent? Isn’t it better for them to have a safe outlet, a parent who adores both them and their complex sibling, to hear them out and bear witness to their hardships? If I censor them, will their vents build into resentment and bitterness that is buried instead of expressed? I’m afraid so, in fact I’m pretty certain. I believe that counseling would be a better option, but let’s just add that to the list of things I’ve failed to accommodate for Alex and Hannah with because the need isn’t so overbearing that I’m forced to act. I let them vent because I need to vent too. I listen to them because validation is my favorite thing, and I want to pay it forward. I don’t know how it feels to be Hannah or Alex, but I do want them to tell me!